Modern laser engravers are great tools for hobbyists as well as professional artisans. When connected to a PC, they work pretty much like your average printer, producing extremely accurate and intricate engravings and etching based on your designs. These machines are usually compatible with modern CAD software and vector graphics editors like CorelDraw. They are very versatile and can work on a broad range of materials, from wood to plastics, metals and even glass. Size and power figures are major factors when deciding on a laser engraving machine. Depending on the material that you plan to work with most frequently, your laser engraving machine choices can vary drastically. The power of a laser engraver is expressed in milliwatts (mW) and watts (W). The weaker (and cheaper) lasers have diodes rated at between 300 – 1000 mW and can work only on softer substances like wood and leather. But the very weak starter lasers cannot work on metal or glass surfaces. Advanced and pro-grade machines usually start with lasers rated between 20 – 140 Watts. The bed size of a laser engraving machine determines the size of the piece you can engrave. If you plan to etch on larger workpieces, you may need to look at a machine with a larger bed size. The resolution of the laser head determines how fine your output images will be on a machine. Resolution is expressed in DPI. On the lower end, you have DPI up to 300, which is enough for simple shapes and block letters. 400-600 DPI is the midrange and can handle more complex designs. At the upper end would be 1000+ DPI machines, which are essential where the highest quality of the image is crucial. This machine has dual connectivity options, with USB for wired connection to your PC, and Bluetooth as a more convenient wireless alternative. You can even connect it to a smartphone to complete the engraving. It has a built in 6000mAh battery to prevent any potential interruptions due to power cuts. With a 1000mW and 1500mW laser option, these are not ideal for harder surfaces like metal or glass. But if you plan to work on wood, leather, paper, or soft plastics, this might be a suitable option. 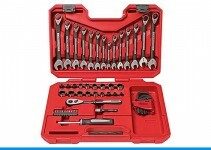 The work area is rather small at just 42 x 42 x 78mm, so factor that into your calculations before buying this machine. The resolution of the laser is around 350 DPI, which is on the lower side. If you don’t need a very high-quality engraving, this setting might be acceptable. It is best suited for simple shapes and blocks of text. You might face some initial trouble setting up the bundled software, but on the whole, this is a good starter machine for DIY enthusiasts. This machine is compatible with MS Windows, as well as iOS, and has a dedicated app for mobile devices. And it also gets both USB as well as Bluetooth connectivity. The 1500mW laser can only handle soft surfaces like wood and plastics. The resolution is on the lower side as well, at 350 DPI. The battery can work the system for a maximum of 3 hours. 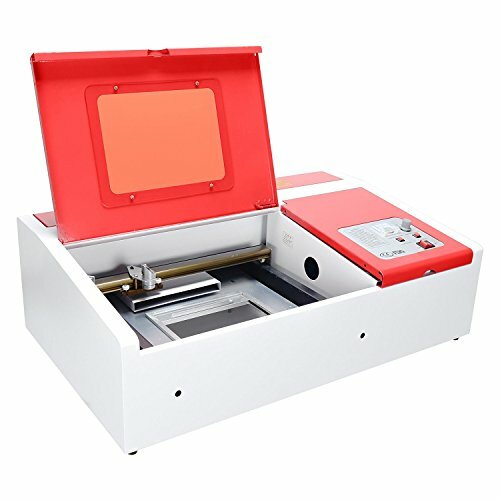 With a tiny work area, 42 x 42 x 78mm, this machine better suited for engraving on smaller objects. On the whole, the machine looks quite sturdy and compact. It comes well packaged, with software provided as part of the package. 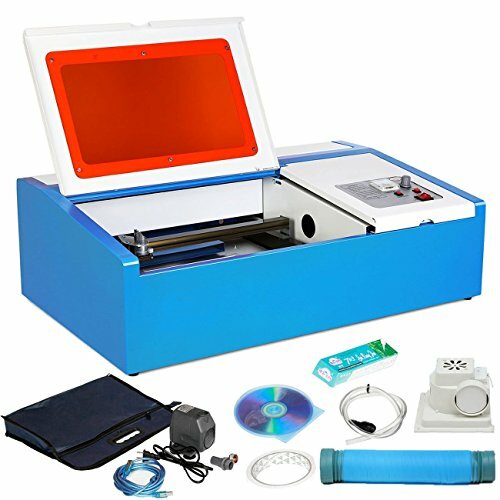 You may consider this only as an affordable starter machine for an introduction into the world of laser engraving. With a 40W CO2 laser tube, this Orion is a much more powerful laser that those starter machines with 1000 or 1500 mW (1000mW = 1W) lasers. It can work on almost all surfaces and materials, except metal. So it is a great option if you want to experiment with wood, leather, glass or plastics. When it comes to metal, it can work on surfaces that have some coating. The laser power can be upgraded to 50W by changing the tube as well. The machine is well made, with CNC machined parts used in the assembly. The work surface is 12” by 8” which is adequate for most tasks. The max resolution of 1000 DPI offers excellent quality images. There is no wireless connectivity available, and this engraver cannot work with mobile devices or Apple iOS PCs. Only Windows is supported, and though they do provide the necessary software, it is poorly designed and not at all optimized. If you want to move on and upgrade from a cheap starter machine, this Orion laser engraver may be an excellent choice. 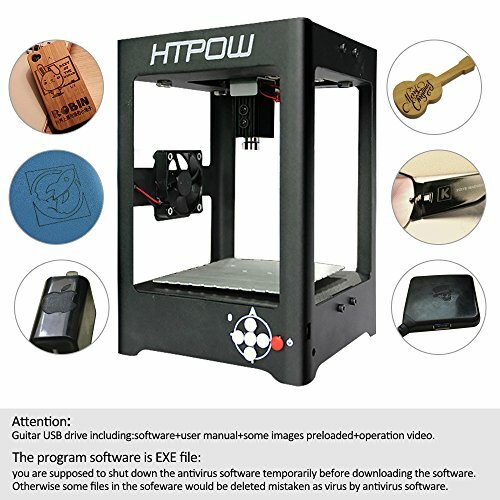 This is an affordable and compact laser engraver with a weak 1000mW laser. It can only work on softer surfaces and does not have advanced connectivity or compatibility options. It will only work with Windows PCs. The device software is bundled as part of the package. The machine is extremely compact and does not take up much space. But that also means that the work surface is pretty small as well. The frame is quite sturdy, and there are adequate safety features on board to protect the user from the lasers. The software is pretty basic, but with this laser, all you can expect is basic text and shapes engraving anyway. The performance is not very consistent, but for a starter machine of this type, that is not a big issue. If you can live without iOS or Android compatibility, this is a basic starter machine worth considering. The WER is another tiny engraving machine that can be used for home projects like engraving small trinkets, crafts projects, mobile cases, key chains and similar odds and ends. It is compatible with PC as well as iOS/Android, so if you need an engraver that works with your mobile, this might be worth a look. Again, this is a starter laser with a 1500mW power capacity, and unsuitable for glass or metal pieces. The work area is a bog standard 42×42 x 78mm (1.6 x 1.6 x 3 inches approx). And the resolution is also pretty low at 350DPI, which is par for the course on a starter machine. The acrylic frame is not as durable as, say an iron-aluminum frame, but it is extremely light and portable. 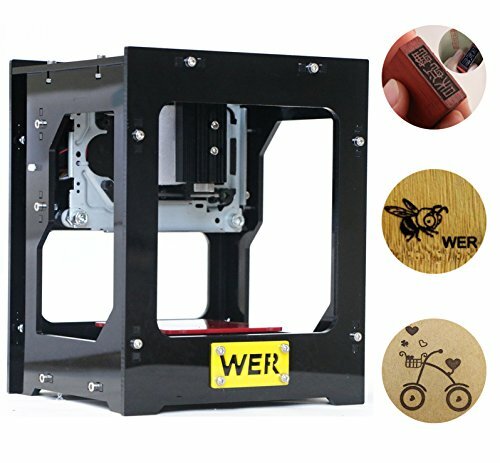 If you want a small DIY engraver on your table in your room, you may consider the WER laser engraver. Just keep in mind that it can only do very small images and that it is quite underpowered. 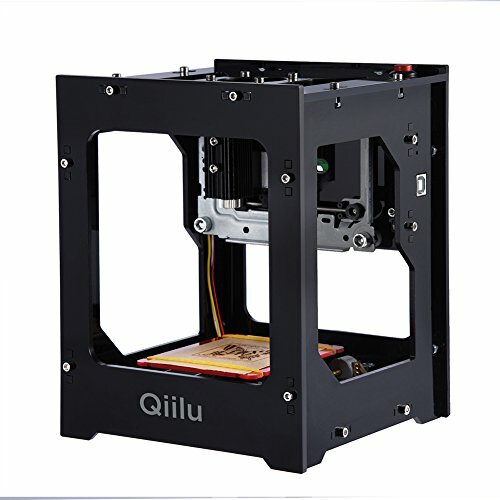 This machine is much larger and much more powerful than the average DIY starter laser engravers sold online. It is mainly a commercial engraver, ideal for a workshop or business establishment. The brand also has a smaller 40W version that you can consider for your home workshop. 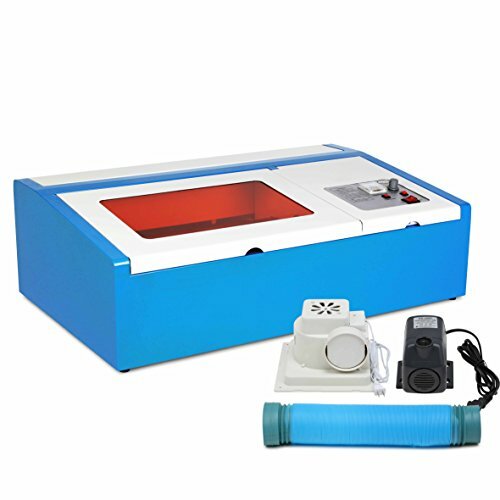 But this particular machine has a more powerful 80W laser, which can handle a diverse range of materials, from wood to plexiglass, crystals and glass, marble, leather and much more. The work area is pretty large at 20” x 28”, so it is ideal for working on larger pieces as well. On the software and connectivity front, it uses USB cable to connect to a PC. 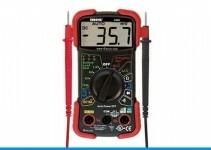 The manufacturer does not specify any compatibility with iOS or Android. The machine does, however, work with most major graphics design programs, and is shipped with a proprietary driver software. As this is a huge and cumbersome device, it comes with a set of four wheels at the base for improved mobility. The 80W laser head has a resolution of 1000 DPI, which ensures excellent finish and exceptional quality on images. There are even advanced options for different colors and shades on the engraved images. This is a very affordable commercial grade engraver for businesses and artisans who need a reliable and easy to use laser engraving machine. 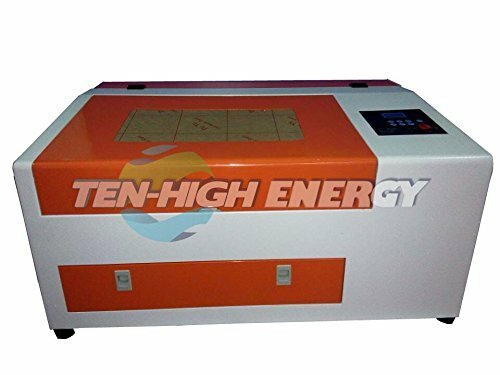 The Ten High engraver is a worthy option for the advanced DIY hobbyist as well as smaller manufacturers who need to engrave logos and designs on their products. The 40W laser has enough power to work on all materials except metal. It can, however, be used to engrave on metallic surfaces that already have some coating. The device is compatible with Windows PC and uses a USB cable for connectivity. There is no advanced Bluetooth feature, or any mobile app either. CorelDraw is the software specified by the manufacturer, but since they don’t ship it along with the machine, you will have to buy your version. 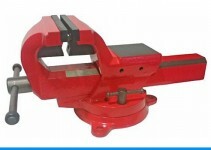 If you want to work on curved pieces, this engraver does provide the option for fitting a rotary axis, which is sold separately by the company. The Chinese firm does cover all the basics, but the language and software support could do with some drastic improvements. 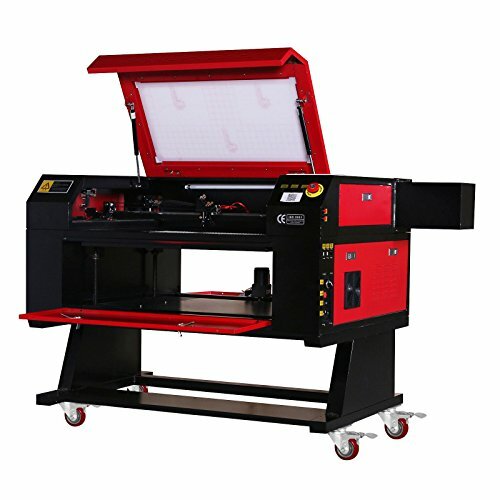 But the performance of the machine is quite decent, and with the optional accessories, this machine offers some advanced features not found on most other laser engravers found online. The CNCShop engraver is quite powerful with a 40W laser, which makes it one of the more advanced DIY options in the market. It can even be a cheap option for professionals working in crafts, furniture, leather, garments, and other similar industries. The work area is neither too small nor too large, at 300×200mm (11” x 7”) and the resolution is quite high at 1000DPI. The machine supports CorelDraw and requires a PC to operate. The software is provided as part of the package. Though the instructions are not very detailed, this engraver is easy to operate. 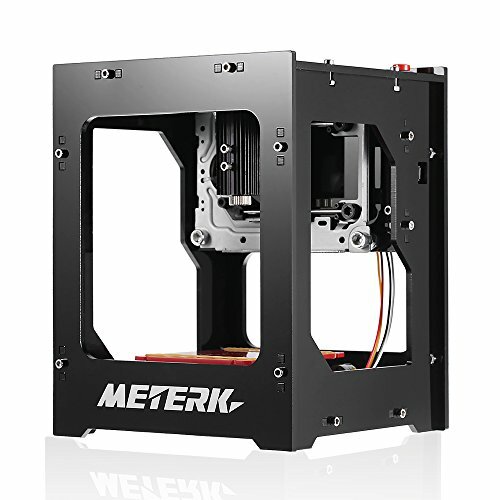 It is a sturdy and compact option for those looking for a mid range laser engraving option. With an identical blue-white body and similar specifications, the Mophorn engraver looks almost exactly like the CNCShop device reviewed above. It has the same 11” x 7” work area, a 40W water cooled laser, and a resolution of 1000 DPI. In all probability, both the devices are based on the same design, or manufactured by the same OEM manufacturer in China. The performance is almost identical to the other machine, and the Mophorn also uses CorelDraw software. It can work on most surfaces and materials except wood and glass. With these Chinese machines, reliability and customer support is always an issue. The software and manual instructions are in poor English, but otherwise, this Mophorn seems to perform pretty well on the whole. With a 80W CO2 laser, the CNC Shop is a beast of an engraving machine, with an impressive work area. It not only engraves, but operates as a laser cutter too. It is powerful enough to engrave on some metals and stone, but is best suited to glass, plastics, vinyl and wood. The work area is 500mm x 700mm (approx 19.6 x 27.5 inches), and the laser is very powerful. The CNC Shop Laser Engraving Machine is best suited for those that have a good understanding of laser engraving, and a knowledge of ‘tweaking’ and adjusting the right parts to get the best results. It comes with an offline control system and supports both CAD and CorelDraw output directly.